West side of the mouth of the Connecticut River, off Route 154 from Route 95. Private residence. 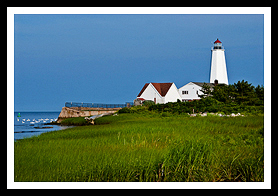 With increased shipping traffic and fishing, Lynde Point Lighthouse was built in 1803 to guide ships coming through Long Island Sound where the Connecticut River empties into the sound at Old Saybrook. 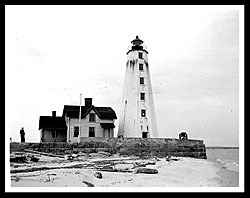 The first wooden lighthouse with a whale-oil lantern placed on top was criticized by mariners as being too difficult to see. They complained it was too dim and too short, and the evaporation from the nearby marsh would cause a constant fog obscuring the lighthouse, even though the air would be clear out at sea. Instead of raising the tower, the lighthouse was rebuilt instead in 1838 with a 65-foot stone tower, with windows pointing towards the water for keepers to watch the busy shipping traffic. A year after the outbreak of the Civil War, John Ninde Buckridge joined the Union Army and fought in Fredericksburg, Gettysburg, and was involved in other small battles in northern Virginia. On March 24, 1864, Buckridge was part of a wood cutting detail in northern Virginia, when his axe slipped and he cut off a toe. Gangrene had set in, and his right leg soon had to be amputated at the thigh. After recuperating and being fitted with a wooden leg, Buckridge was discharged in July of 1865. He joined the lighthouse service a few years later and tended Lynde Point Light successfully from 1883 to 1902 with his one good leg. Buckridge and his wife Margaret had six children. Thomas Buckridge, the couple’s only son, became a lighthouse keeper himself, finishing his career at nearby Saybrook Breakwater Lighthouse. Actress Katharine Hepburn lived for many years near Lynde Point Lighthouse and Saybrook Breakwater Light. Old Saybrook offers plenty of community events and historical New England 19th century Victorian architecture. It is one of the yachting capitals of the Connecticut shoreline and boasts as being one of Connecticut’s earliest settlements. You can take a swing at the Fenwick Golf Course, or head to the bowling lanes. Take a nice shoreline drive to enjoy the views. You can find nice views of Lynde Point Light (private residence), which you can observe a few hundred yards away along shore and also get some good distant views of Saybrook Breakwater Light nearby. From US Route I-95 North, take Exit 67 to Elm Street and turn right. From US Route I-95 South, take Exit 68 to US Route 1. Bear left and follow Main Street (Route 154) to Saybrook Point. You can take photos before the causeway. To get the best views here may take a little discretion. You can also cross the causeway on the right and take the first left on Nibang Ave. This is stated as a private road that goes along a residential golf course, so you may need to ask permission ahead of time to just take a few photos. The grounds and lighthouse are not open to the public. You can also get a distant view of Saybrook Breakwater lighthouse. 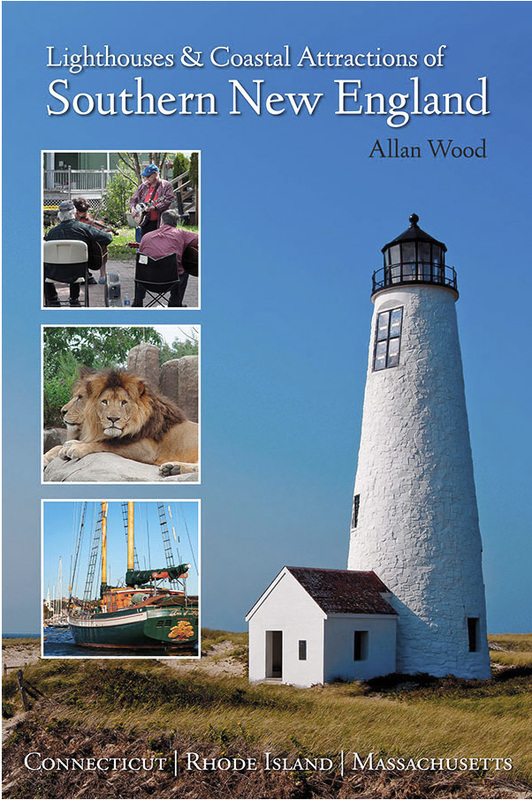 Provides a lighthouse cruise to both lighthouses in Old Saybrook along the mouth of the Connecticut River, usually in August. May also charter to lighthouses. Luxury cruises all along Long Island Sound, and along the Connecticut River shoreline.